start to get hot. You can hear a small whine as the motor reaches full speed. But mounted correctly that will not be a problem. In all, I think the motor will be a good choice as a dome motor. small items and it works fine. Here's the type of motor I plan to use for my dome drive. Now these may not be as fast as the other motors, But I just got mine in the mail and they are quite and strong. The only thing I did notice is a small amount of slop in the gear when it starts up, But I'm hitting it with full 12v. so it just takes off. has a perfect spot to mount the motor. Just need to make a mounting bracket and I'm good to go. This maybe the motor I use for the Periscope lifter. I don't know if I will need this speed or a slower one. The reason I changed to Vex was due to price and not needing an on board computer. But, Since Intel now has a Micro ITX board with a reasonable price I'm going back to my 1st plan. Using this board will allow me to have Video, Sound, and use a Logitech Wireless Gamepad instead of the Vex remote. The gamepad has more buttons and the software will allow me to combine buttons for more features. The code learning will take me awhile to get it figured out, But the forum for Phidgets has allot of helpful information. and can be controlled by the Ebay 12ch remote. I'm back to researching options for this setup, But so far I'm not even scratching the surface of what can be done with a computer on board. But these buttons have a blue light around the edge of the center and I like them this way. There's also 1 button on the top of the dome and it's painted the same way. Still not sure what I'll use thes for, But they're there if I need them. Here's a comparison of a weathered R2 and my R2. As you can see in the pics the detail panels show up much better than mine shows. I'm thinking more and more about this and I really like the dirty look. And with mine in the sunlight, You can't see the details at all. This video is just to show how my R2 is slowly coming together. I still have along way to go. But if I can get the skirt, feet and a few details finished then I can finally start wiring. And yes this is my Junk room. I know it looks terrible, But working on R2 you can make a mess easily. I didn't like the A&A mount for the legs. motion. So I took some aluminum plate and added some angle to the top where it bolts to the top frame ring. This will give me a strong mount and also I have the holes set for 3 legs. I've tested it on the other leg and it's much easier to mount the legs and it feels allot stronger. Since I made my legs from wood, I had to adjust each leg for the correct tilt of the body. These are the magnets I plan to use on the rear door. They fit the aluminum channel, 1 will be on the inside of the channel and the other will be recessed into the door frame. You can see in the pic how the aluminum channel adds a nice frame for the door opening. If I would have had 2 long channels I would have run it from top to bottom, But I only had some scraps and had to splice the bottom. And the other pic shows the inside how the door and the channel comes together. This aligns the door every time it's put on the droid. I started on the DREADED door!!! I really don't like this door, But you have to have it to gain access to the electronics in R2. The A&A frame comes with the door hinged by a threaded rod, But it doesn't work that good. So I started framing the skins to allow the door to slide into place and I'll add magnets to the door frame and the new skin frame to hold it in place. As you can see I ran out of aluminum near the bottom of the skin. I'll have to buy some more and finish this later. Everything turned out pretty good except for the Horseshoe. It's not bad, But right around the edges of the silver area there is some rough showing. I'll touch it up as soon as it dries. Once all these parts dry, I'll put them back together and get R2 back on his feet. 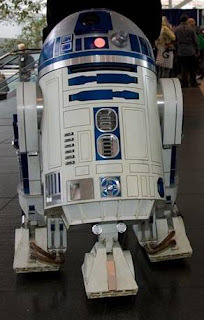 I'm not ready to make a decision, But I'm thinking more about weathering my R2. I had the skins out in the sunlight and even though the paint is a Satin finish it's just too bright. You can't see the details on the skins and it kinda blinds you from the light. If I do the weathering, It will be lightly done not a heavy coat. I'll do the weathering to it. So, Guys I really need help on this one. Polystyrene on the leg. After this I sanded it down and gave it the 1st coat of primer. This will show me any bad spots I need to fix. Tomorrow, I'll be able to sand the leg and hopefully paint it Satin White. I got the rear skin painted today and you can see I painted the inside like I did the front skin. Now I know the inside doesn't look all that great, But I just wanted to cover all that bare aluminum. The camera makes the skins look shinny, But it's a Satin finish. I finished my rear Pocket Vent today. I had the paint allready complete, Just had to add the deep channel to the bottom and I bonded 1 of the rear doors. Once I get the other door mounted, I will repaint the rear skin and it will be complete. Just showing where I stand at so far. Yeah it's my junk room with all the droid goodies. As you can see in the pic, I need to clean up the wiring. But you can see the Micro switch on the right. This will control the Leds on/off functions. In the video the lights are on when the door is open and they shut off when closed. You can also see that area by the hinges that I need to take care of so the insides don't show. I installed the Charge Port today and I'm waiting for the bond to dry. Once I can work with it, I will install the micro switch on the rear so when you open the door the lights will flash. Now the Leds in this setup are set for 12v., So when I'm charging my 24v. main batteries it will not interfere with anything. You can see to the left near the hinges I need to do some work and I also want to find some fiber cloth to hide the hinge openings, So when the doors open you can't see inside the droid. The small door that is taped shut is where I will mount my switches to protect my electronics while charging. I have it taped down right now because the magnets on the inside are drying. I got the front skin and the inner door panel painted today. I also painted the inside of the skin. I couldn't stand the Aluminum showing and this was a big improvement to me. This will be the last time I paint the skins, It's allot of work tapping all the goodies on the outside. So if it gets banged and scratched, It will be weathering to me. I installed another inner skin design, Although this is not where this design was meant to be placed. I wanted something on this door so when it opens and my unnamed gadget comes out it will look good. I also hinged another door. It's the little one by the front vents. I never intended on this one opening, But I need a place to hide some switches. As soon as everything sets up, I'll start painting and installing the charge port. I started installing the A&A inner door skins today. I used Amazing Goop to glue the design to my Aluminum door. Once I get everything finished on the front skins, I plan to paint them one more time. This will be a paint job for the outside and inside. I'm jumping around allot on my current build because I'm still sore. But allot of small things will get done.